The annual quest for thoughtful, imaginative holiday gifts can make you feel like your brain is roasting on that perennial open fire. We at the Weekly are here to help. As we have for several years now, we present our annual holiday gift guide retrieved from the Internet’s twilight zone to make the holidays unforgettable for their recipients. Trigger warning: this column not a safe space for the humor-challenged. Chanukah came early this year, but if you want to shop early for next year, Modern Tribe has an extensive selection of lovely, imaginative and whimsical menorahs. 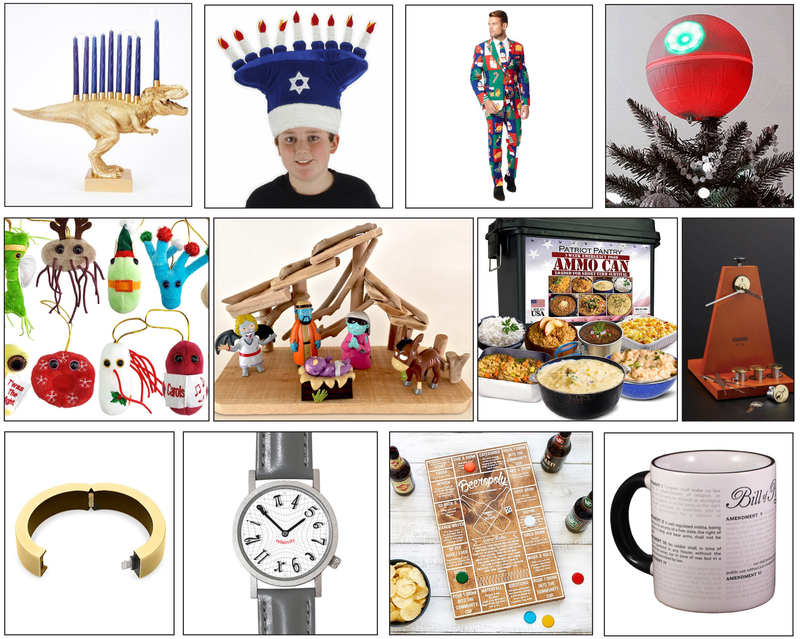 We think the crown jewel of the collection is the gold T-Rex menorah. “Fun for the whole family,” the company says. Joanna Valente over at Kveller.com calls them “Hanukkah Miracles.” Velociraptor and Apatasaurus “menorahsaurs” are available from The Vanilla Studio. Modern Tribe also has “fashionable and functional” menorah hats. Kohl’s outstanding offerings in the holiday suit category will have you donning your gay apparel like never before. “Make a stylish statement this holiday season with this men’s OppoSuits novelty suit and its eye-catching pattern.” Comes with matching necktie. Women aren’t left out. Holiday suits in women’s sizes are also available. Why settle for routine and predictable holiday decor? Let your Christmas tree make a truly original statement with ThinkGeek‘s Death Star Tree Topper. The Death Star lights up blue or red and plays traditional holiday classic carols with the Imperial March or the classic Star Wars theme. We look forward to the entire Darth Vader holiday collection. Includes Kissing Disease, E. Coli, Penicillin, Salmonella, Red Blood Cell, Flu, Fat Cell, Bookworm, Nerve Cell, Sore Throat, Stomach Ache and the “exclusive” red Amoeba — remember kids, don’t eat the pretty pink snow! 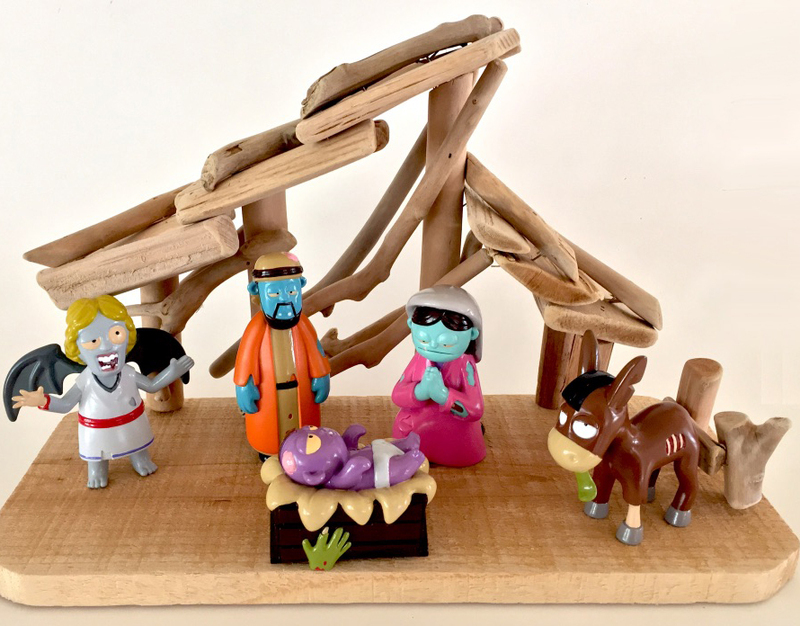 To go with your toxic tree consider NerdTalk Toys’ Zombie Nativity — new this year. 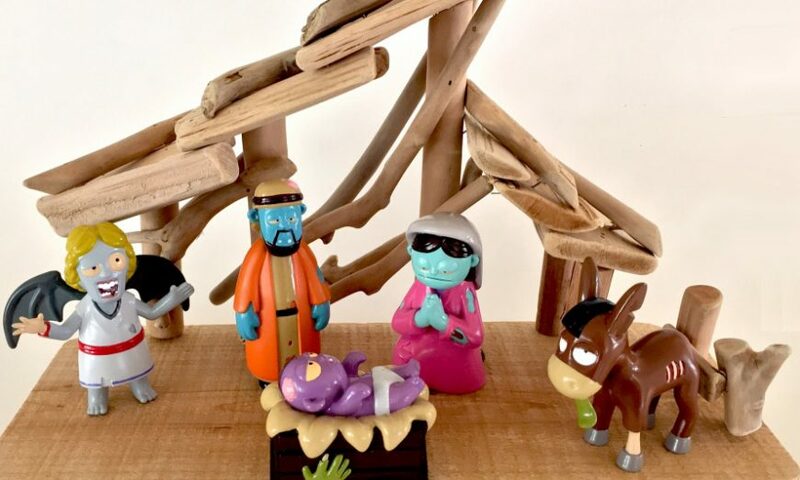 Includes zombie versions of Jesus, Mary, Joseph and the Angel Gabriel as well as an undead Donkey. Creche and barn not included, so you can add your own post-urban apocalypse landscape. Or just replace the figures in your traditional crèche and see how long it takes for your holiday guests to notice. Nuclear preparedness has gotten a new lease on life recently. And what better way to encourage your loved ones to be prepared than My Patriot Supply’s 1-Week Food Supply Ammo Can with 42 servings of freeze-dried food. “It’s Not Just Food, It’s Freedom,” says the company. And when you’re done with the chow, you still have the handy ammo canister. “The time to grab extra ammo ISN’T when the flames of a riot are nipping at your front door,” Modern Combat and Survival reminds us. Since last year Touch of Modern has gone mass market and, alas, abandoned many of its niche items. However, ToM still has treasurers for the persistent searcher like the not- advertised-on-TV Ultimate Lock Picking Trainer. “Lock picking is an exploding art,” explains ToM, “complete with professional competitions around the world. The Ultimate Lock Picking Trainer has everything you need to get started with the basics, and will have you picking 5-pin locks in no time.” Bail not included. These days, with our phones telling us the time, some may think wristwatches are superfluous. But when the phone takes on the utilitarian job, let your wrist become a reflection on the nature and meaning of time with the Unemployed Philosophers Guild’s Relativity Watch. According to the Philosophers, it’s the “first watch where the numbers rotate around the face of the watch, proving unequivocally that time is relative” with a “never-ending parade of digits and symbols” that “is hypnotically cool.” See you at the Event Horizon at i. In Northern Europe the Winter Solstice coincided with the beer being ready to drink, thereby establishing one of the enduring institutions of winter holidays, namely intoxication. This year, brew up some of your own fun with Beeropoly, the beer-drinking board game from Uncommon Goods. “This game will make your Saturday night go from Netflix and chill to game night and cheers,” reports reviewer Sarah. Finally, although holiday family get-togethers since 2016 have been tense as everyone worries who’s going to start an argument about politics, here’s something the you and your Republican/Democrat brother-in-law can agree on: The Unemployed Philosophers Guild Disappearing Civil Liberties mug, usable by both left and right handed people. For more than 200 years, Americans have always agreed on one thing: that their rights as citizens are under attack — from Democrats, Republicans, the Illuminati, Nancy Pelosi, Donald Trump, Brett Kavanagh, Jed York, the Deep State, the Military Industrial Complex, Google, the Department of Homeland Security, the Vatican, Big Pharma, the Koch brothers or shape-shifting Ancient Space Lizards from the lower fourth dimension of the space-time continuum. Pick your villain and have another hot toddy. Salut!